Just the mere selection of fine shirts can make your dress look alluring thousand times more. Especially when it comes to party and wedding events, the cuts and shimmers of your shirt only can spark the sight of others. Beautifully embroidered shirts in mesmerizing hues add greatly to the outlook of the entire dress. So what kind of shirts are going to hit the markets this wedding season? For each wedding season, surely every girl goes after the variety and novelty in the dresses and trends. So, grab your purses and get to shop as this season number of new trends will hit your sight and fancy Pakistani Party Wear Embroidered Shirts Designs will catch your attention. Here we have gathered some of the latest designs of Pakistani Party Wear Embroidered Shirts Designs for you. These are by famous Pakistani brands and designers such as Elan, Nomi Ansari, Zainab chotani and much more. 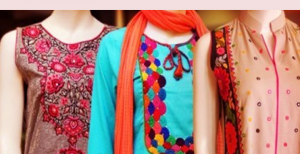 Have a look and get inspired by the latest Pakistani party wear embroidered shirts designs. Embroidered Dresses with Stone Work. These are excessively popular because of the delicacy of the stonework done by them. These dresses are designed using fabrics according to the event and desired outlook; hues are kept bold and colourful especially for Valima events and other semi-formal functions dresses with stonework are the preferable choice. Intricate patterns of fine embroideries are created using the stone over the neck and the borders of the shirts. These can be worn with trousers or tulip pants keep the length of the shirts considerably medium. Embroidered Shirts with Zari Work. Zari is a traditional way of decorating dresses since centuries and since now its demand is very high and famous. It gives dresses a unique blend of elegance and beauty. On weddings, parties different styles of dresses are made on which zari embroideries are done with fine threads. Here we are posting some of the zari embroidery designs of shirts. I hope you will like them. This kind of shirts is adorned with the high dose of embellishments. Multiple sets of embroideries including dabka, tilla, zardozi and zari work are used over the shirts. The shirts are designed in multiple layers using chiffon as the fabrics as it gives far more elegant and prettier outlook. These shirts are in contrast with the plain bottoms and are carried with lightly embroidered chiffon dupattas. 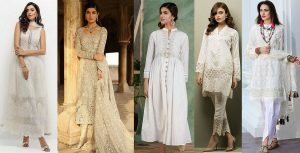 When it comes to designer wear, many eminent designers including Maria.B, Zainab Chottani, and others have created a huge range of embroidered dresses for this season. Their collection is a whole world of an option you can opt for. Embellished dresses with simple cuts, embellished dresses in Kurti style, flared shirts with decent embroideries and much more. Their collection catalog clearly states the new twist for the wedding season, yes! The embroidered shirts, available in a lot more different hues and contrasts. Party wear dresses and their hues with adornments are kept a little light and mellow. Especially for evening parties and function, colors might be bold, but the embellishments are comparatively not that heavy, touch of applique work and thread work with a little dose of shimmery colors are enough to highlight you were walking down the floor. For wedding occasions, long shirts with trousers, lehengas and shalwars are created using such tempting adornments that you can’t refrain yourself to buy them all at once. Work in ivory, silver, and bronze is the common sight to see. Wedding wear dresses are designed using soft pastel hues for Valima events and barat occasion trend of double layered shirts with embroideries over the upper looks perfect. A heavy layer of embroidery over the bottom of the shirt complements the shirt.